A message from Dr. De Lisle…. 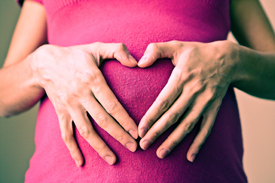 Dr. Marisa E. De Lisle has always been passionate about working with pregnant women and children. As a second generation Chiropractor and a mother, Dr. De Lisle has always used Chiropractic as her primary source of health care. Dr. De Lisle has completed additional hours of education specifically to be able to care for pregnant women and their children. She is certified in Webster Technique and has improved the mechanics and function of many pregnant women during her career. By improving the function of the mothers’ pelvis, many babies who have presented breech have been able to turn in preparation for natural childbirth. Dr. De Lisle is excited to be part of your journey into motherhood! Pregnancy is a magical time in a woman’s life and keeping the spine, pelvis and nervous system free from stress can help create the best experience throughout pregnancy and delivery. We look forward to welcoming you into our family and are honored to watch your family grow! During pregnancy, there are several physiological changes that occur in preparation for creating the best environment for the developing baby. Establishing pelvic balance and healthy alignment is an important aspect of a woman’s prenatal care. When the pelvis is misaligned it may reduce the amount of room available for the developing baby. This restriction is called intrauterine constraint. A misaligned pelvis may also make it difficult for the baby to get into the best possible position for delivery. Because the nervous system is the master communication system to all the body systems including the reproductive system, keeping the spine aligned helps the body function more optimally. The late Larry Webster, D.C., Founder of the International Chiropractic Pediatric Association (ICPA), developed a specific chiropractic analysis and adjustment which enables chiropractors to establish balance in the pregnant woman’s pelvis and reduce undue stress to her uterus and supporting ligaments. This balanced state in the pelvis makes it easier for a breech baby to turn naturally. The technique is known as the Webster Technique. It is considered normal by some for a baby to present breech until the third trimester. Most birth practitioners are not concerned with breech presentations until a patient is 37 weeks along. Approximately 4% of all pregnancies result in a breech presentation. The Journal of Manipulative and Physiological Therapeutics reported in the July/August 2002 issue an 82% success rate of babies turning vertex when doctors of chiropractic balance the pelvis using the Webster Technique.